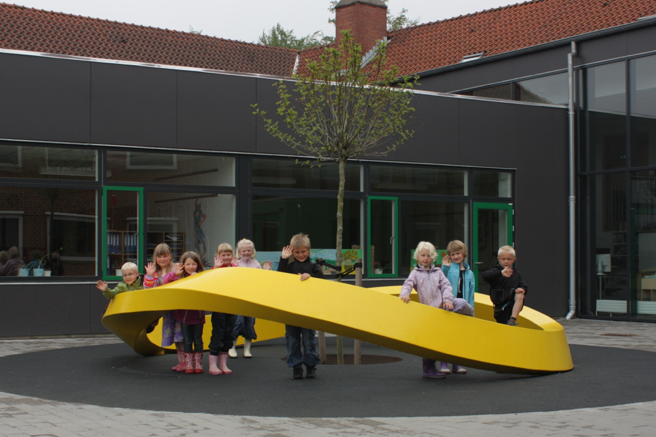 Möbius serves as a beacon, and as a playful structure for this municipal school in the Danish town of Sjølund. In collaboration with artist Pernille Worsøe and designer Martin Larsen, David Garcia Studio created this work based on the möbius strip, a single surface with non-orientable properties which triggers the mind and the senses. The circular shape functions not only as a playground with, a rich formal and textural vocabulary, but as a unifying element for the school, where it becomes a meeting point for the institution and a symbolic gesture for curiosity.